For all the times I said or sang “I’ll Go Where You Want Me to Go, Dear Lord” back when I was in college I probably never fully understood the meaning of “going”. We hear about others who go to far-away foreign places as missionaries to do God’s work, ministering to the locals in these areas. We think to ourselves that we want to do likewise because maybe if we go too, our work will be valuable. But are we really willing to go where God sends us? What does that even look like? 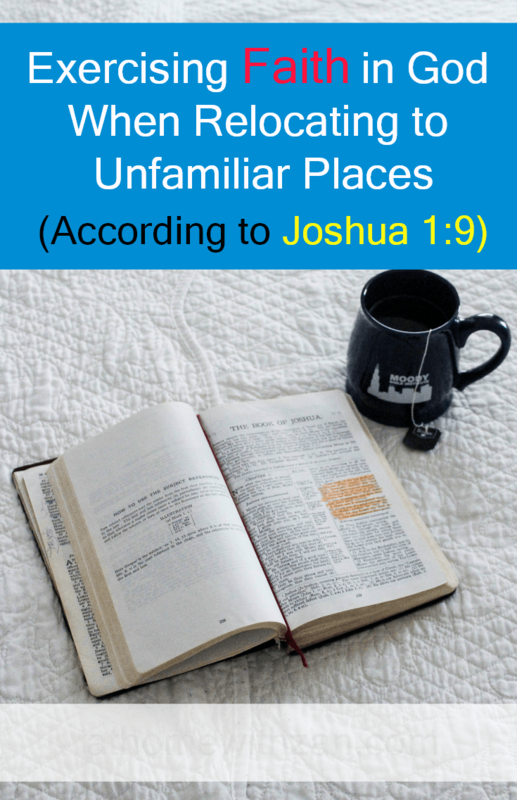 Because sometimes God doesn’t want us to go anywhere except to minister right where we are – in our Jerusalem (Acts 1:8), especially if we now have our own family. It starts there. Husbands are called to minister to their wives and family first and wives are commanded to be good keepers at home (Titus 2:4-5, Proverbs 31:10-31). And if God desires to move your family to another area for some other work or purposes of His own then it’s no longer a solo operation. It may not always be someplace familiar or some place most desirable. It may be out of our comfort zones and what we love. What will keep you motivated to remain strong during such times? For us it’s our Faith in Jesus. God desires us to be strong, without fear and without dismay because He is with us. He will make our way. This verse springs from vs.8 that commands us to meditate on God’s Word and to obey it that we may prosper and have good success. When we practice vs. 8, it is then that vs. 9 will make sense to us. Throughout God’s word He commands us to be strong, be not fearful, be not discouraged… for He is with us. If we meditate upon these truths according to vs. 8 then it would be easy to practice vs. 9 already knowing God’s promises. Admittedly, sometimes that’s easier said than done. When the loneliness hits, the feeling of being misplaced comes along, the sense of not knowing how to function in the new area, the fact that things are not familiar and as comfortable as you’d like is when discouragement want to set in. It’s when we find our selves drifting into a state of discontent, fear, and weakness in the faith. But oh weary one, God is with you. God himself will make a way where there seems to be no way. Let’s turn our eyes on Him and trust in Him to guide us along the way (Psalm 16:8). What is your circumstance today? Are you trusting in God to lead and direct you through it? But what about when God calls us somewhere? Are we willing to go? Are we REALLY willing to go?